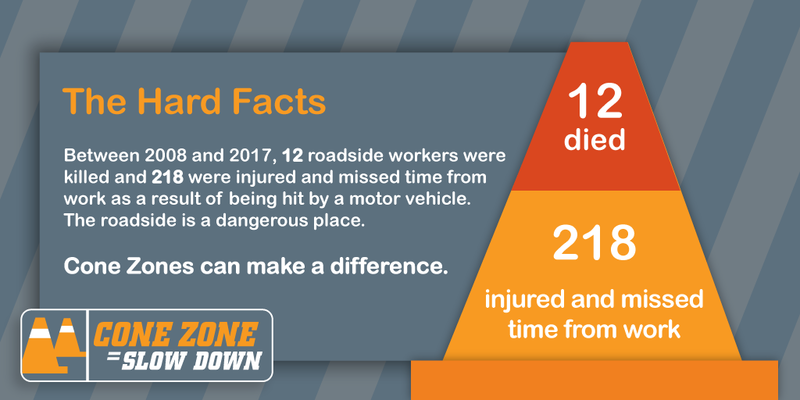 These startling stats make it clear drivers need to undergo a major shift in attitude to help protect people representing a wide range of professions – from traffic controllers and construction crews, to emergency personnel and truck drivers tending to their vehicles. A good place to start thinking about roadside worker safety is by hearing their stories. We all need to respect the Cone Zone. We lost a flagged here in the Okanagan it devastated a lot of people, yet there were several people I spoke with that were unaware that such a tragedy had even happened. Slow down people I want my mom to come home. Thanks for your note – a great reminder for everyone to slow down in the cone zone. I wonder whether the variable speed limit signs were being used on Friday on the Coquihalla to warn traffic approaching the line backed up by the lane closure for paving? HI Nick. Thanks you for your interest in our new variable speed limit signs. I am checking into the answer to your question. Hi Nick, our operations manager for that area tells me that, yes, there was notification on the overhead changeable message signs on the Coq, to warn of the construction (paving) ahead. This echo’s of the “British Cone alert hotline”, which after its introduction resulted in numerous calls to the NHS to report injured cones on public highways, before the concept was finally abandoned. It appears that having given WorkSafe BC and its buddies control over workers safety, many traffic control companies have taken it upon themselves to overdue the number of cones and markers placed in our work zones. This has lead to considerable confusion among drivers, many can not even determine which way they are to go, while others panic and try to get out of the seas of orange as fast as they can. The safety of workers relies on professionalism of the TCP, not girlie’s wandering about these very work-sites chatting with or watching workers doing their jobs. They need to pay attention to traffic and work with professionalism not attitude giving they are of an opinion they have authority. If we want to improve safety, we also have to limit the number of work zones operating along roads and routes to a minimum at any one time. Not only will this improve safety, but will provide for ongoing work opportunities for all, rather than just short seasonal work. I’ll travel through BC next week, from Alaska, it’s a good idea do it through highway 37? It’s all the way paved? Thank you for your comment/question. Highway 37 is 60% paved and 40% sealcoated, one section near the Stikine Rivers is gravel (about 900M). Hope that helps. I am a tow truck driver on the north shore and Squamish highway and my complaint is people are NOT obeying the law regarding stopped tow and emergency vehicles , which is to slow to 60kmh and move over…we are out here trying to help motorists but not to risk our lives in doing so. Thanks for letting us know your concern. We will continue to share this messaging.